Has left Everton which is as unsurprising as can be. Football is after all meant to be a source of entertainment for fans. With all the money in the PL now, there seems to be a desperation to stay in the PL and keep their noses in the trough. Fans want to enjoy going to watch their teams, but, certainly at the top level, the clubs/managers just want the PL riches and sod the paying punter. http://www.football365.com/news/stop-fretting-about-relegation-instead-embrace-it Great article about embracing relegation. Agree with the article. The gap is widening between divisions. Its all driven by money. Most seasons are like a horse race where the majority of teams dont even want to win. Its not "their year". There will be a lot of going up and coming straight back down in the football leagues, especially when clubs cannot bridge the financial gap after going up. Realistically they need to completely overhaul the team with better players to do the fans justice, or they lose heavily every week. It a shame that to go up and stay up, teams need to have a budget not just for the current year but an even bigger one put aside the year after too. Most are losing money so it just doesnt happen. Sky have us where they want us. The lower league teams are staying put. The starlets who parade their wares in the lower leagues of course see only the huge money available elsewhere. Careers are so short they have to move with the money. Managers the same but journeymen like Allardyce have nothing new to offer, no flair to bring, and are shut up shop merchants who aim only to stay up. I would rather be watching a team play and win at its level, than play at any level we arent ready for and get hammered every week. Before Rochdale went up recently, they were about 35 years in L2. This last couple of years was their Wembley. I suspect they may fall to pieces a bit now and lose key players and be at the bottom next year. Iirc, I'm sure I read somewhere that none of the promoted teams in the PL and FL were relegated this season. I don't reckon Rochdale will be as bad as they were this season either considering the previous seasons they were battling at the top end of the table. Not bad work if you can get it! Work 6 months, sacked with rest of contract paid off. Give it 4 months and carry on with the game again. To be fair to him, he inherited a badly imbalanced squad with a marquee player who is past it. 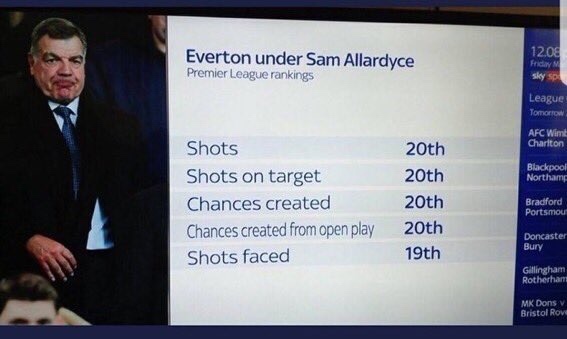 Allardyce has my dream job at the moment, half a years work for 18 months of big money, he will have the summer off then sit in the sky sports studio as a pundit getting paid while waiting for the relegation fire fighting job to come in. Management contracts in the lower half of the PL seem to run from November - November these days, and today has proved it to be even more brutal than that. There seem to be two types of managers in the PL these days. All PL clubs want to find the next big thing, the guy who can get them into the Top 6 on a medium-low budget, certainly nothing compared to clubs with Champion League money. This is usually because a rich buyer comes in, invests 70-80 million on transfers, and assumes that must surely be enough to transform a mediocre team into Europe contenders. Because every team in the Premier League is doing this, 3-8 random teams find themselves around the bottom, because someone has to be down there. They then panic and turn to the other breed of manager. Safe hands Allardyce, Hodgson, Moyes, or (not in the case of this season) Pardew. They do a job, but as an owner you don't want to be giving your millions to an over the hill boss who seems incapable of achieving what that fancy new chap from Portugal did last year at Benfica in a drastically less competitive league. It's been going on for years. Curbishley at Charlton, Allardyce at Bolton, Martin O'Neill at Villa. All were told 'thanks for the years of overachievement, but we need to move to the next level.' Few years down the line and they're back in their natural habitats. I think the football Everton played was entertaining,people jump on the bandwagon with the critsism of him....they seem to think they are a top top club but should get real and understand Man city,manure,liverpool,spurs,chelski,arsenal are light years ahead of them and they are on par with the newcastles and leicesters of this world. Why shouldn’t fans, who pay a lot of money (and particularly in the PL and in a city where wages are probably lower than more affluent parts of the country) be entertained? I have no problem with SA and think he’s excellent at firefighting, getting teams organised and avoiding the drop. However, his Aladici comments from a few years ago have come back to haunt him. Everton have been safe for months and he spent a lot in January. To continue setting his teams up to play so regressively despite having the opportunity to finally show he can play expansive football was a disaster. I’m sure he’ll have no problem trousering a few million quid and getting a job at the next basket case club by November next year. Wouldn’t want his style of football beyond one season personally although I see lots of Sunderland fans on Twitter are demanding Stewart Donald appoint him as he was a big success there. Although he didn’t have much joy in getting promotion from the third tier in 95/96 I recall! Fact is, Everton got allardyce in to save them from going down. Once they were safe, the perfomances did drop off. You know what you are getting with allardyce. Hard working, difficult to beat teams. That suited Everton when they were shite, but not now that have a new season to plan for in the premiership. Built an excellent team @ Bolton. Sam's villa in Spain is named "St James". Newcastle fans paid for it. Cost a few million. God. I love Big Sam. And will happen with us. Gone on then, enlighten us?